Going into the desert. It’s a concept loaded with meaning and not just for those of us who’ve broken our hearts watching Deborah Winger in The Sheltering Sky. 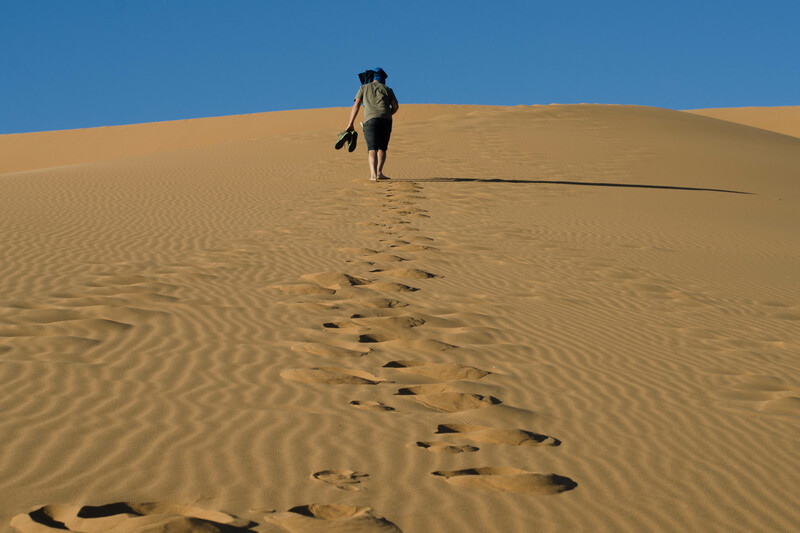 From Laurence of Arabia to Jesus’ forty days and forty nights, it’s impossible to escape associations with solitude, vast unrepentent wilderness and the deep domed sky. I went to the desert expecting to feel small, to look out at miles and miles of undulating sand and contemplate my own insignificance amidst the hugeness of it all. 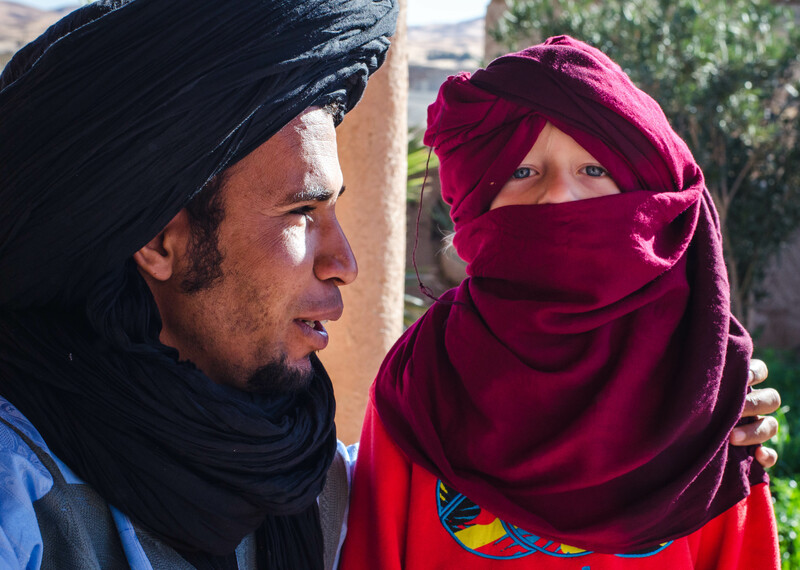 Trekking on camels to a Berber camp? A night under the desert sky? This would surely be the ultimate traveller moment, wouldn’t it? 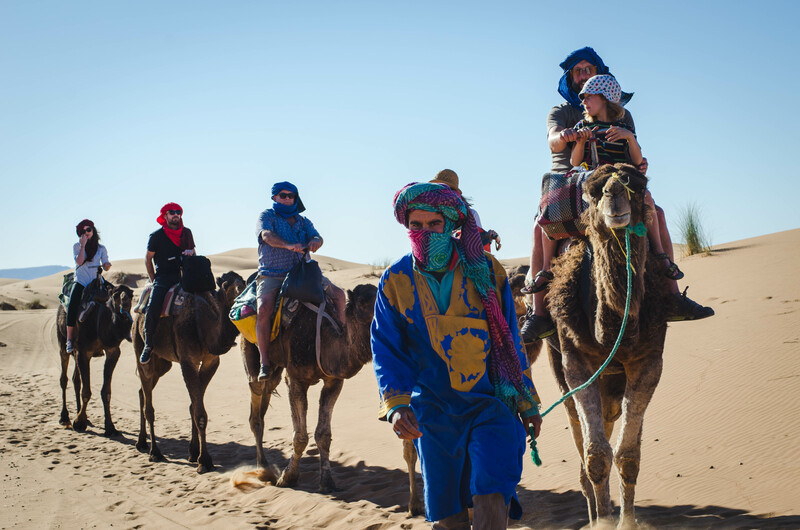 Our desert ‘experience’ started with meeting our strangely lovable tour organiser and being taken to meet our camels and guides. The guides were dressed for tourists in the blue Berber robes we’d come to recognise at all the Moroccan visitor hotspots, but my first thought as we wobbled off on our camels was that if the guides were on foot surely that made our camel transport surplus to requirement, nothing more than a quaint and uncomfortable folly? I was soon distracted though by our surroundings. Like a postcard desert the dunes rippled and rose in sinuous, silken beauty; curvaceous golden beasts against predictably crystal blue skies. As we rocked and rolled our slow painful way around the edges of the sandhills, Monty sat spellbound in front of me, quieter and more reverential than I have ever known him to be, checking evey five minutes that we still had a long way to go, fearful that at any moment his magical ride would end. 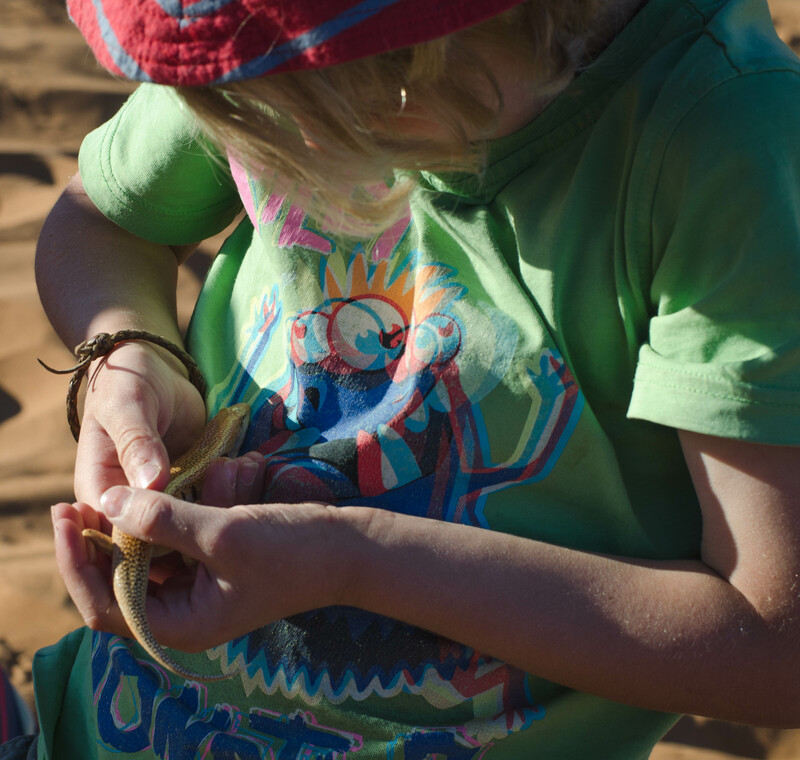 We scanned the sand beneath us looking at the various tracks left by desert beasts. 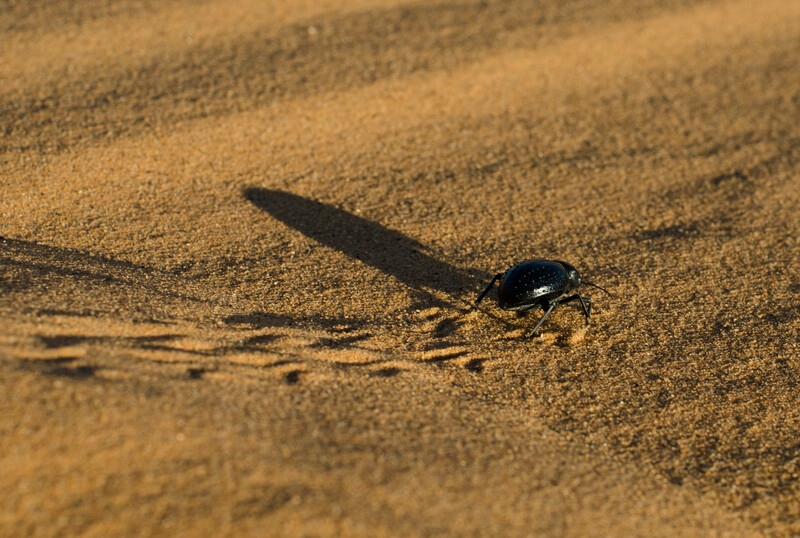 Crisscrossing the ground were the small scurrying marks of the scarab beetle, and the occasional footprints and tail traces of salamanders. 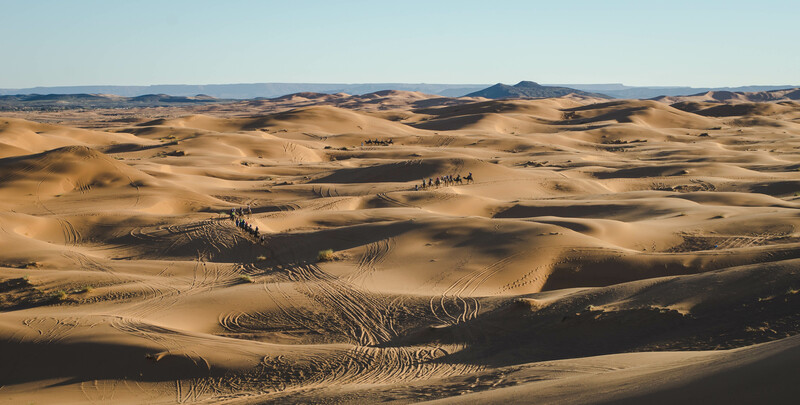 Soon though, I started to notice other tracks; lines of camel footprints, where many camels had obviously walked many times and then, the even less romantic tracks of quad bikes and dune buggies. Looking up from the sand I noticed that on all sides we were surrounded by activity and the air was filled with the noise of it. 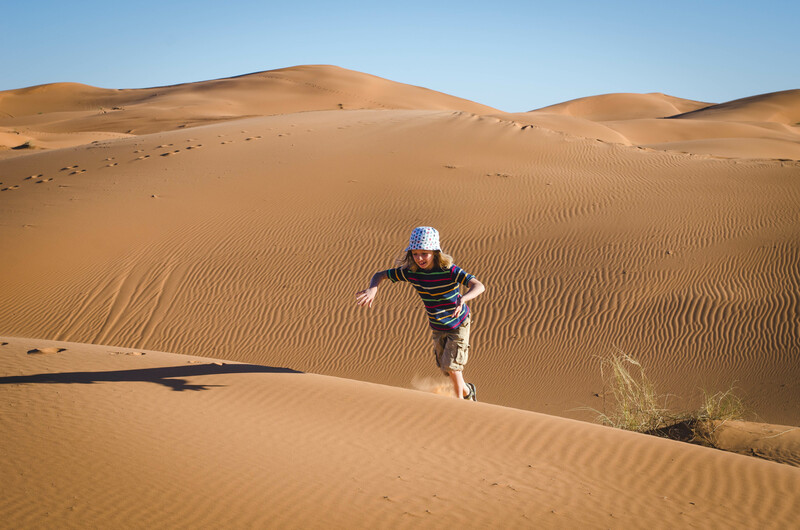 Quad bikes were zooming over and around the dunes, the drivers whooping and shouting. We saw a truck – a huge great lorry – trying to get up a dune then tipping over onto its side; pathetically revving its engine like a bug on its back, legs pedalling pointlessly, while flapping people called suggestions to each other. At the edges of all this chaos, I saw that the dunes were only a few kilometres across and beyond them was scrub, mountains, some green land and even water, a lake maybe. This wasn’t the desert I’d been looking for. Don’t get me wrong, we had a great time. 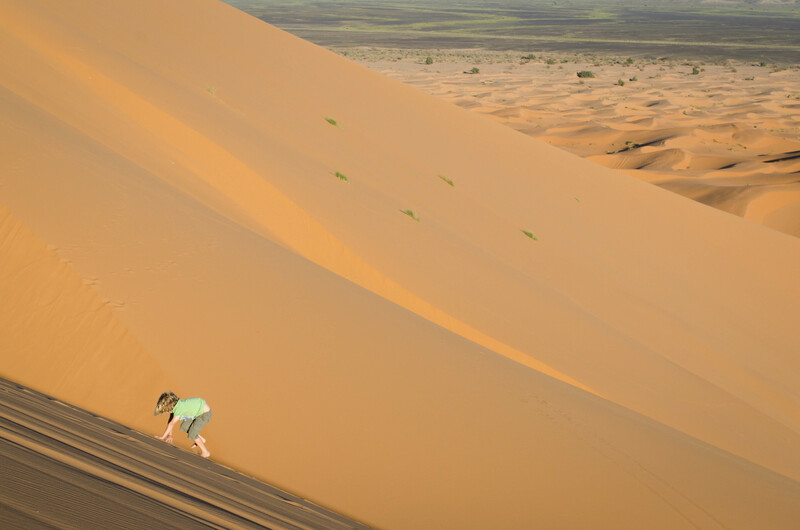 It was a lot of fun for all of us to scramble and climb up the towering Erg Chebbi dune. 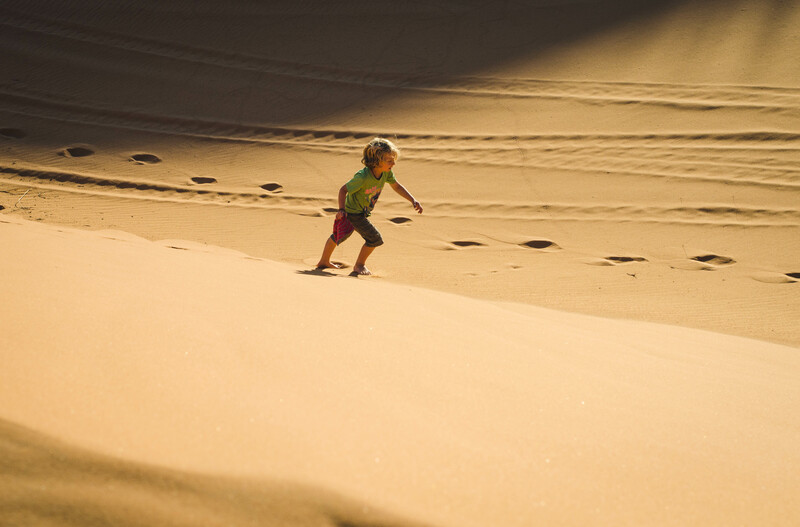 I loved watching Eli and Monty tirelessly running up and down and up and down the dips and hillocks of sand. It was one of the funniest moments of our relationship watching Rob attempt to sandboard, initially triumphant as he started his descent then falling and calling out about suspected unspeakable injuries. The guides were fantastic, our fellow trekkers good company, the sunset and sunrise really genuinely special family moments. But the experience left me craving something. It left me with a desert-shaped hole in my life. And this is the trouble with modern travel, everything is packaged and nothing is new. Our Berber tent, a place in my imagination that might have had a fire burning in the entrance while the nomadic guides sat and quietly kept an eye out for snakes while we slept, was in fact a metal framed tent with nylon ‘velvet’ sheets that glowed when you rubbed them. Our organiser Mohammed drove out to us on his quad to bring a sand-board to where we were, then sped back to the town, making the whole ‘camel trek’ thing feel even sillier. It is harder and harder for any of us to find ‘authentic’ travel experiences and, I suspect, it becomes harder for the people whose homes these are to be authentic. 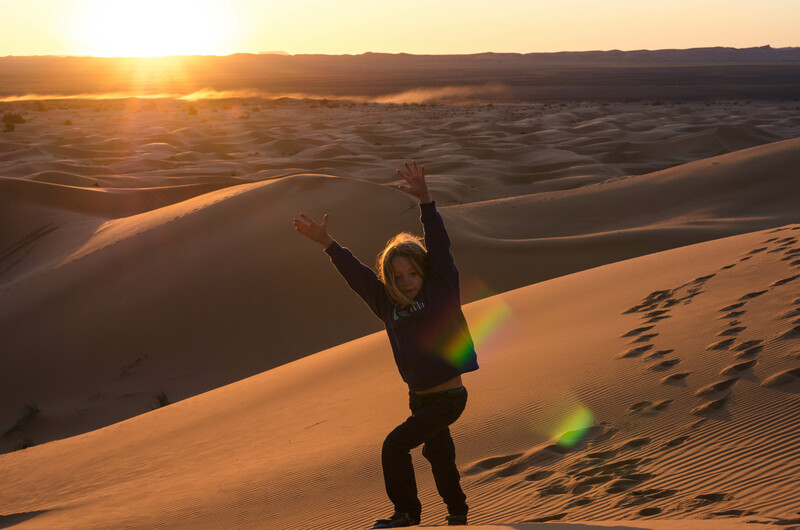 We travellers and tourists by our very presence change the fundamental essence of a place.Yes we bring money, the possibility of an improved quality of life for some, but their way of life, hundreds of years old, is changed forever – like the desert that is no longer deserted. I know this, and yet I also know that I will keep looking for the ‘real’ thing. There is wilderness that still exists, there are deserts that still stretch on for hundreds of miles where not a soul sets foot, where our sense of the sublime could be truly satisfied. Just not here any more. 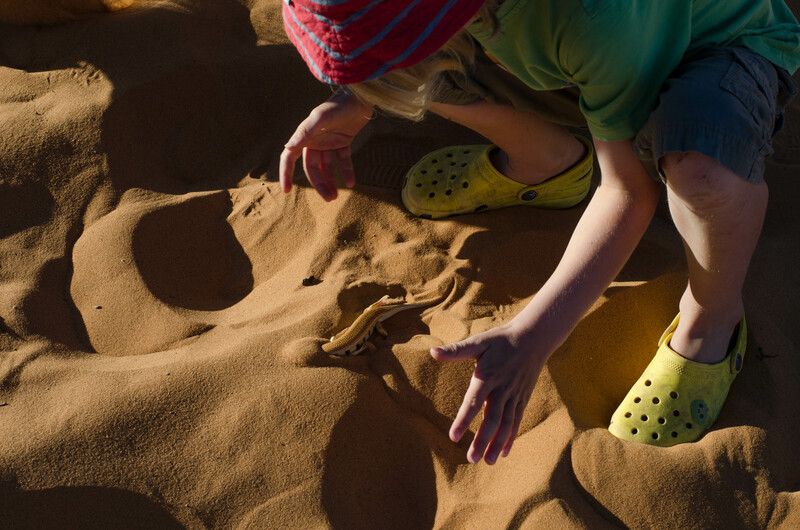 Every year in Merzouga there are more hotels and more tour operators, better roads and improved services. The double edged sword of tourism continues to fall. 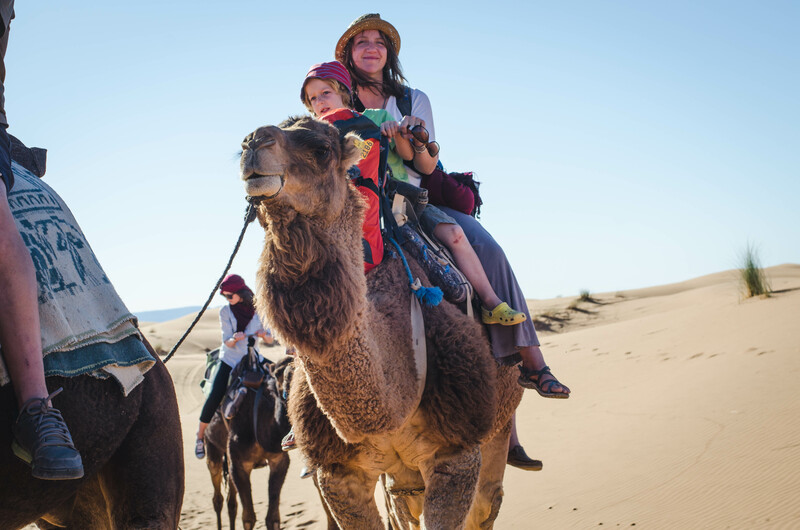 And if you want to get a sore backside riding on a camel, scare yourself silly boarding down a sand mountain, watch your children running downhill at speed with no fear of falling and witness something exciting and fun but not terribly unique, there’s no better place to come. Just don’t go expecting to feel like Deborah Winger, or you could be disappointed. Thanks Tuds. How’s the house?? Another great piece of writing, on the one side moving and funny on the other thought evoking with beautiful pictorial language. What a special one you are Selina Gough. Fantastic blog, just love it!